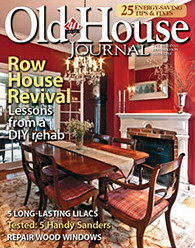 We had a bit of an unexpected home disaster this week. Luckily our house didn't have some massive damage or problem. The issue that occurred was definitely a serious inconvenience, but hopefully our ridiculous experience can help you if you need to handle a similar clean up. The morning started normally, but as I descended our stairs in the darkness, a scent I wasn't used to hit my nostrils. Was it the pine if the Christmas tree? Perhaps, but why all of a sudden, as the tree's been there for weeks. It wasn't until I opened the basement door to retrieve my coat from the basement stairwell/coat closet that it hit me -- the whole first floor of our house had a distinct perfume smell. It took me a minute to place the smell, and then I realized it was TIDE FEBREZE SCENTED DETERGENT!!!! Uh oh. Why was the scent of our detergent of choice suddenly wafting throughout our house? It smelled lovely, but I knew something was amiss. Remembering that I had run a load of laundry just before going to bed, I nervously walked down our basement stairs, wondering what I would see. I had visions of a flooded basement dancing in my head. But when I got down there, this is the disaster that lay before me. It looked like the murder scene of an unsuspecting smurf. It seems that our washing machine was possibly off balance during the spin cycle and rocked the super sized and nearly full bottle of 96 load Tide HE detergent off of the top of the machine and it had fallen to the floor. If you're calculating at home, that's like $15 in wasted liquid soap. 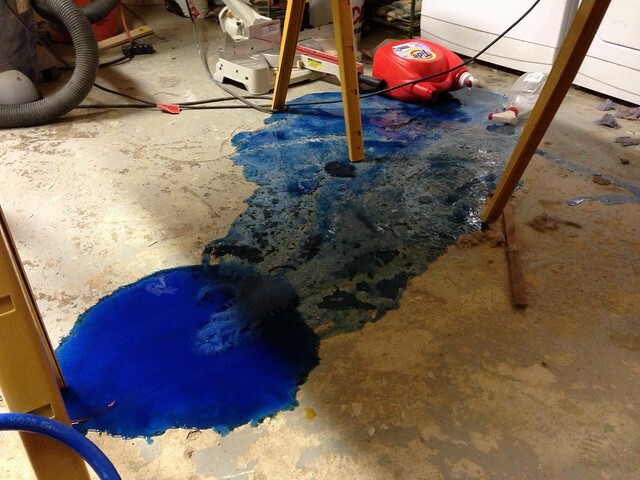 Not only had it fallen, but it had landed on the upper plastic cap and burst open, flooding the basement with the thick sludge of blue soapy freshness. 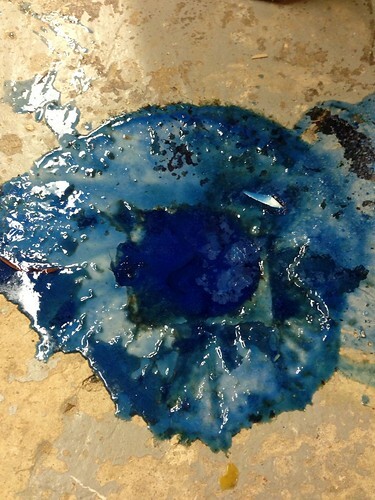 When the bottle hit the ground, the lid cracked and the contents blew up all over the floor. A nearby pile of wood, an innocent bystander in the ordeal, looked like it was the victim of a crime. Someone call Dexter, because we need a spatter expert to reconstruct the crime and determine just how this wood hoard met its fate. I had to head to work and couldn't deal with it in the morning, so I put off cleaning the mess until the evening. You know, the evening this week I had earmarked to be super productive and work through my checklist of projects. When I arrived home later in the day, I had forgotten about the looming chore, but when I opened the back door to the house I was rudely reminded when the smell of a cool summer's breeze smacked me in the olfactory senses. After screwing around on Twitter for a good two hours, I put my procrastination aside and got to cleaning. 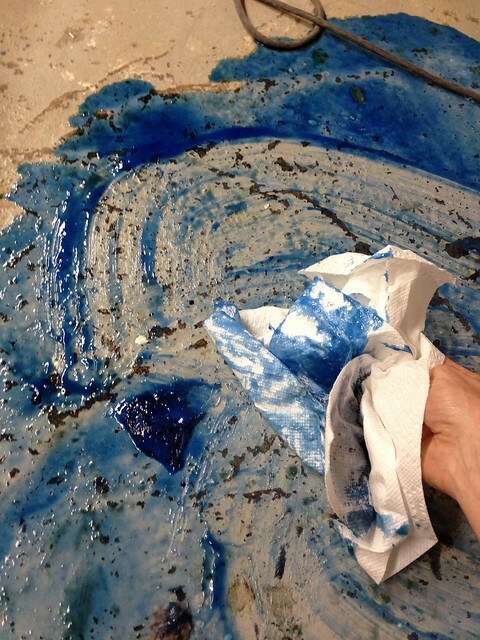 Before actually trying to mop up the soap, I first had to clean the mess I had in the basement on top of the spill. We are mid-project down there, so what do you want from me? After all of my tools were put away and the space cleared, I kicked off my efforts with a wad of paper towels. I didn't have high hopes for this approach, and the hopes I had were quickly dashed. It seemed the paper towels just spread the sludge around. I knew I needed a better way to clean up the mess, but how? As I thought about how to clean, I figured I might as well try to salvage as much of the liquid as I could. I started scooping the blue goo from the center and pouring it back into the container. I felt a little like a weirdo doing this, but I figured it was okay if a little dirt got into the container. I mean, it's soap...right? I was able to reduce the puddle of freshly scented sludge in the middle of the basement by a pretty substantial amount. And once I was done with that piece of the cleanup, I needed to find a good way to get the rest up and off of the floor. 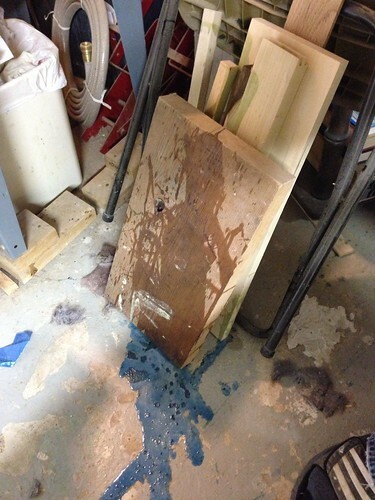 As I looked around our basement for some material to clean the oozing slop I didn't see many things that would work. I was thinking about heading out to the store when my eyes landed on a bag of cat litter. Though the litter wasn't the clumping kind, it was still worth a shot. I tore open the bag and spread some of it on the detergent as a test. After allowing it to sit for a few minutes to absorb the liquid, I wiped the litter around and evaluated its effectiveness as a detergent cleaning solution. IT WAS WORKING! 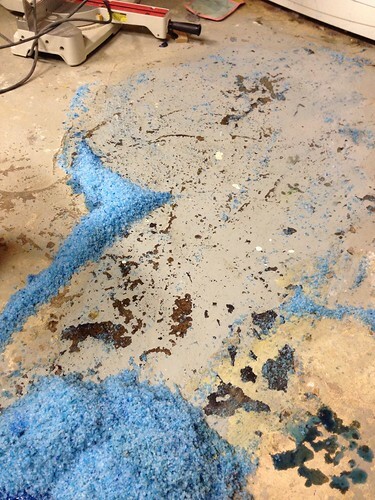 The litter had absorbed enough that the floor was no longer blue. I dumped out a a bigger pile of cat litter and began spreading it around with my hands. Note: If this ever happens to you, put on gloves! I got some of the detergent on the back of my hands and it started burning after a few minutes. I slowly worked the litter toward the middle drain, wiping and cleaning as I went. After about 20 minutes the floor was looking much better, and we just had a giant pile of litter in the middle of the floor. 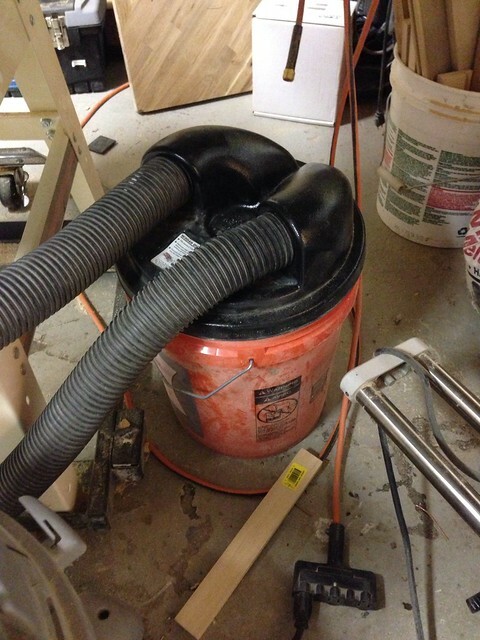 To clean this pile I used our shop vac, but not just our Shop Vac. I knew the detergent and cat litter would fill the vacuum too quickly. To remedy this, I used our dust collection bucket so the litter would settle there rather than in the vacuum. Once I had the majority of the litter picked up, I had to clean the remainder of the film left by the soap. I first tried water but that was simply making suds and leaving a slick mess. 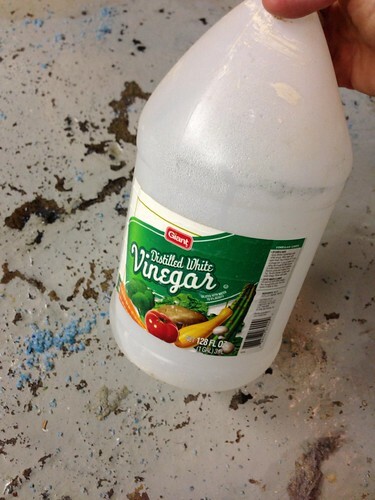 I changed course and tried using some distilled white vinegar, because vinegar solves everything. After pouring it on the floor I used handfuls of paper towels to wipe up the mess. After about two hours and two rolls of paper towels, the basement was finally clean...err...at least free of soap. I can see the outline of where the detergent settled as the floor is extremely clean in those areas, but it's not like the floor is in good shape, so I'm okay with that. Finally clean, our basement is as fresh smelling as it's ever been, but I could have done without the wasted evening. But if this ever has to happen again, there are a few things we're going to need to add to our shopping list. Primarily, I wish we had clumping litter and a mop in the house, but I think I did alright with what we had on hand. Though the evening ended up being more or less shot from a project standpoint, I learned a few valuable lessons. Stop putting stuff on the top of the washing machine that might cause a problem if it falls. 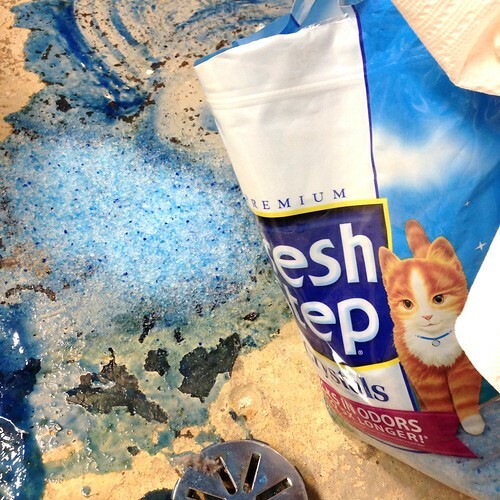 Cat litter and vinegar can solve many problems. Twitter can be totally funny and awesome and is often a great way to procrastinate. 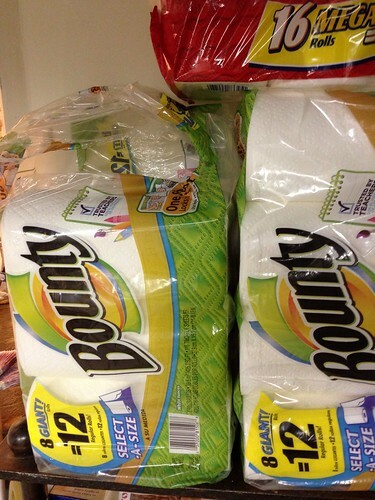 Always keep a massive supply of paper towels in the house, as you never know when you'll need them. 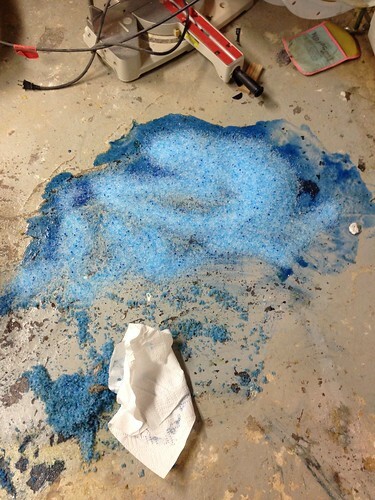 Have you ever had a disaster related to laundry detergent? How about a similar disaster that derailed your otherwise productive evening plans? Let me know what problems have taken your night by surprise so I can feel better about a waste of my evening. This is one of my favorite posts. I am going to pin it on pinterest for future reference!!! Jesika Davis HAHAHA, Too funny! I love it! I just assumed you were making some super cool offshoot for the really cool kids in the neighboring town of Whister. I went ahead and linked both of the hash tags up for you, but allowed your misspelling to stay in the interest of Internet posterity. We'll see you at #whistleranddonuts 2013 (Date and location TBD and TBA, but it's totally happening). This exact thing happened to me a couple of months ago -- laundry soap is surprisingly hard to clean! We don't have a cat or kitty litter (which looks like it worked really well! ), so I used a squeegee and a dustpan to get up most of it, and then white vinegar like you did to cut the suds while I got the rest of it cleaned up. The worst was having to move the washer and dryer b/c detergent spread underneath. Definitely a frustrating way to spend an evening! I don't know why, but when we have a mess anywhere I almost always reach for the vinegar. We definitely got lucky with the floor being pitched towards the middle and not under the washing machine. We had a similar experience when we lived in a rental loft. We did not have in unit laundry so we kept our detergent on the top shelf in our front coat closet, which also held such things as every jacket and pair of shoes we owned, as well as the vacuum, broom, and the hot water heater (usefull closet that was). One night when trying to get something off the shelf I knocked over a brand new tub of liquid laundry detergent to the bottom of the closet where it promptly burst into a million pieces expelling detergent everywhere in the closet. We quickly sprang into action, but not quickly enough, that sh*t got everywhere. We didn't have a cat, nor were we quick thinking enough to use something other than water for cleanup. We sopped up the mess with every single towel we owned, then tried to rinse said towels in the tub. We discovered hot water made a bubble explosion, and instead resorted to rinsing the towels with freezing cold water. This resulted in blue hands and two hours later the closet was (mostly) clean. However the soap was never completely eliminated from the sliding door track, and until the day we moved every time you slid the door open you would smell a lovely Gain fresh scent. We're lucky it all went to the middle of the floor with nothing in it's way. I can't imagine trying to clean this stuff out of tools and all of the nooks and crannies that our basement has. Too funny on the sliding door track. Maybe we'll get some prolonged freshness out of our spill too. Just ordered a 79 version of that book. Thanks for recommending it! Do you know what year yours is? I can't even imagine the freak out I would have if I were in that situation. Great thinking, Misty, and thanks for the tip! I know all logic points to an off balance washing machine, but I think it's Mrs. O'Bryan up to her mischievous ways. Maybe she's trying to tell you something? Ha,ha. Yeah. Had forgotten to tighten down the lid. Needless to say, back into the laudry room, needing to spend the weekend's beer money on running all my clothes through the washer and dryer AGAIN. At least you knew your clothes were extra clean! The wasted time alone is killer in that situation, even forgetting about the money for more detergent and for running the laundry. Misty Koper Thanks for the story, and for the tip on the LUSH. I had a similar dishwasher situation in college. Living in my fraternity house we had to do a load of dishes before a party. Well, one of the guys threw some laundry detergent in the dishwasher, and before we knew it, the whole kitchen and basement area was filled with suds. That incident then led to a bubble party. Problem solved We'll definitely need to check on that deodorant. And don't worry, we know you don't have pit-odor. None of our readers have pit odor, that's a fact, and it's been verified by a valid third party source! Wow. 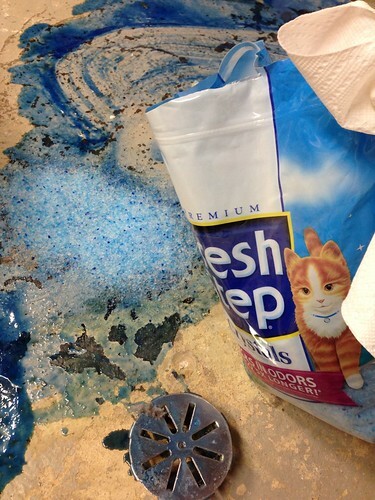 I never would have thought to use cat litter for messes like this. Genius! And conveniently, thanks to the little ball of fur running around our house, we always have some on hand. Thanks for sharing! It's funny how often you see cat litter used in every day places. 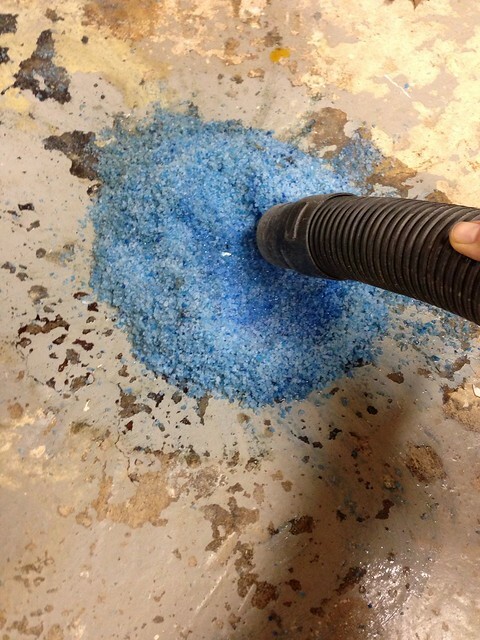 I mean, if it's good enough to clean oil up from a NASCAR track during the race, it's good enough for our basement. I can't even imagine trying to clean something like that out of the grout. Might be easier to just scrape the grout out and put in new. OMG, I thought it was only me that this happened to. I came downstairs one morning to the scent of Sam's Club pseudo-Tide (quite pleasent) and wondered, "Why can I smell laundry detergent?" 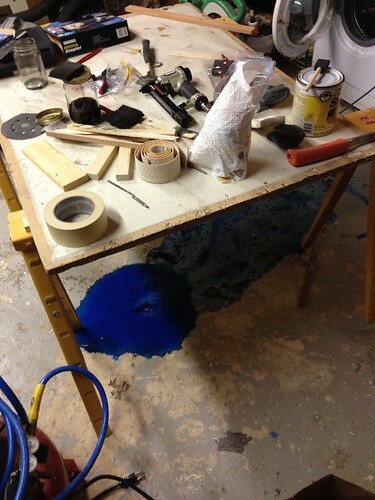 I then went in the room and there it was, the big blue puddle and the smashed orange container (only half spilled). I suspect the cat is the culprit because she has been in the habit of jumping on top of the washing machine and sleeping on top a comforter that had been left there. I, too, left it for after work. I then used every dry towel in the laundry room to sop it up. The worst part was moving the washing machine to clean under it; a combination of detergent, dust bunnies, and cat hair. Though I did recycle the detergent by placing one of the sopping towels in each load of laundry in lieu of filling the dispenser with detergent. 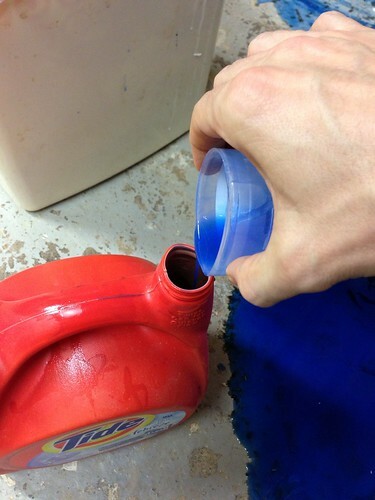 What a great idea to use the detergent-soaked towels! We couldn't bear to waste that much detergent, but this seems to be a better solution than trying to scoop it back into the jug! We just had our brand new monster-size container of Arm & Hammer HE laundry soap mysteriously fall forward off a shelf in our basement. We're thinking poltergeist because nothing else makes sense. 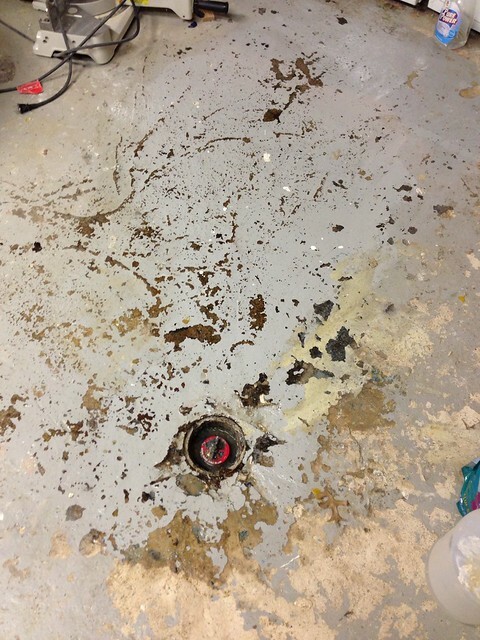 Anyway, most of it went down the basement drain. Since we don't have a cat, we have no kitty litter; however, I opted for baby powder with cornstarch to completely cover the remaining mess. 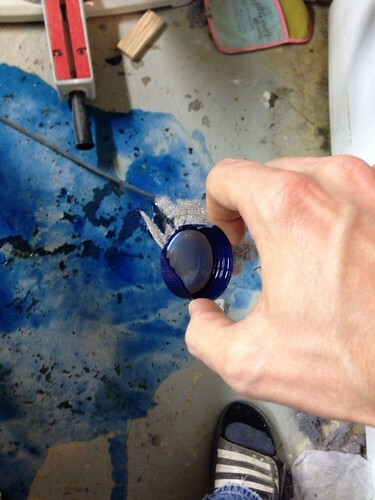 Once it soaked up the soap on the floor, I used a putty knife to scrape it up and swept that mess with a broom. I'm going to try vinegar next to clean off the residual on the floor. My biggest concern now is the HE soap in the drain. We get suds popping up from the drain whenever we use our wash tub. I'm thinking about pouring some vinegar down the drain to see if it will dilute the soap. Fingers crossed!! Thanks for posting this. 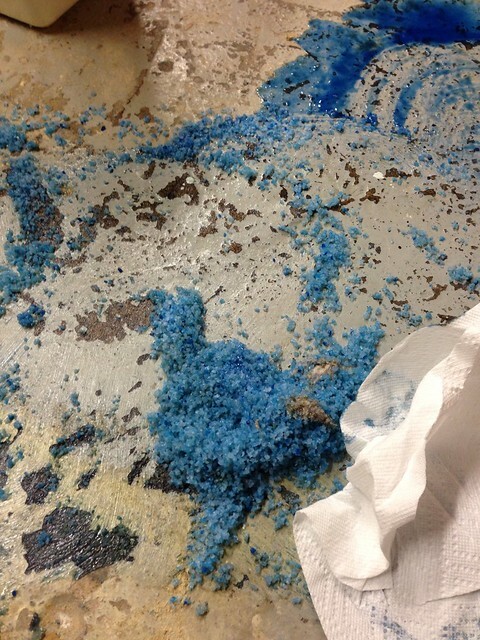 We had a laundry detergent spill over the weekend and spent part of our weekend cleaning it up. The spill was very slippery so using kitty litter helped provide some much needed traction in addition to absorbency.